There is something rather sensual about working with eggs. As a testament to the yolk, there has been a parade of custards, curds, ice cream, pound cakes and pâte sablée in my kitchen boudoir lately that all successfully elicited moans of pleasure. I was not anticipating the extent of my attraction, however, to the dessert that came from all the whites that were left over. This light yet sumptuous 'cloud' cake, with its layers of sponge and abundance of coconut-y meringue, won my heart and the hearts of those who tried it. It prompted the licking clean of plates, adamant promises to not share with a significant other, and the comment: "This is the cake I didn't know I wanted, but I wanted it - so badly!" While egg yolks ooze an obvious and immediate sensuality with their rich, caloric reputation, I find myself enchanted by the intimacy of the egg white. There is a slow, subtle chemistry that occurs when whipping egg whites into meringue. What starts as a clear, unassuming liquid is slowly whipped and frothed into white mounds of sticky-sweet glossy confection: soft and billowy or stiffened to a peak. 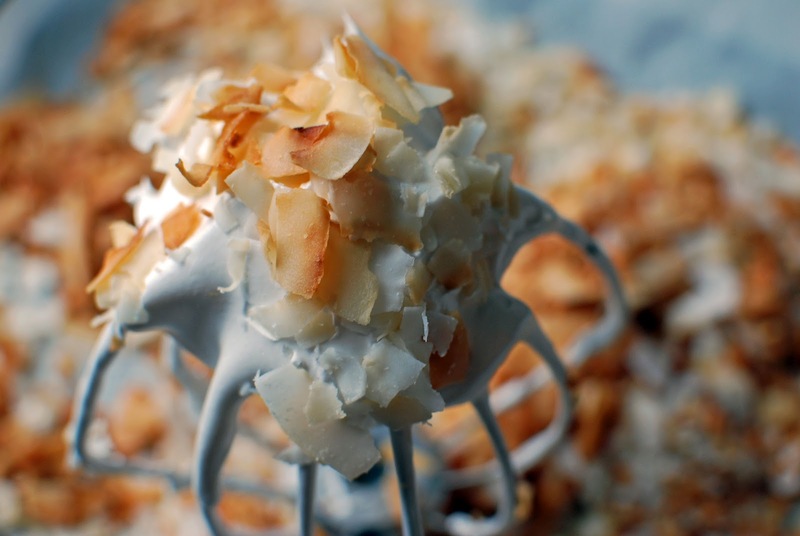 Egg whites are used both for the cake and the frosting in this dessert, the latter from which I could not stop myself dipping into toasted coconut and licking straight off the beater. To decorate this cake, I took a cue from some Pinterest inspiration and tried my hand at making pineapple flowers. Thin slices of pineapple are baked in the oven to form natural-looking flowers to add a pop of colour to the otherwise white palette. The trick here is to use a serrated knife (I used my bread knife) and slice all the way around the core, rotating the pineapple as you go, before slicing straight through. The 1/8" slices are baked in a 225 degree oven for about 1 1/2 hours, rotated occasionally, until mostly dry. They are then placed into muffin tins to curl up into a flower shape. 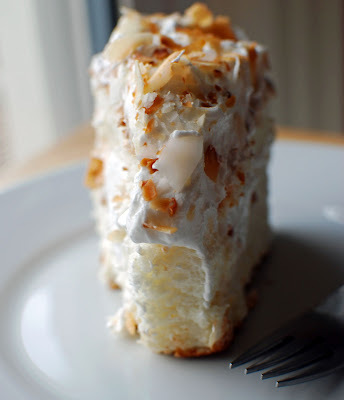 The cake base is essentially an Angel Food cake, flavoured with coconut extract, that makes your kitchen smell like a tropical vacation (or feel like one, as I chose to bake on a day that was already summer-hot). Egg whites are whipped until stiff and gently folded with sifted flour to form a light batter, which is then baked until golden brown. Gravity is then defied in a neat trick where the cake pan is up-ended on a glass bottle to cool the cake upside-down, so it does not deflate. For the frosting, more egg whites are beaten with sugar over a double boiler, taken off the heat and whipped for seven minutes until glossy and voluptuous. 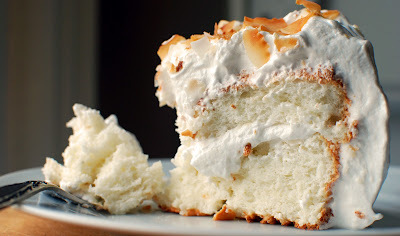 The top inch or so of the cake is sliced off and set aside, and a one inch trench is cut into the bottom of the cake and filled with meringue. It was 'really challenging' figuring out what to do with the fresh, delicious, conveniently bite-sized pieces that were removed. The top is replaced and the entire cake is enrobed in the soft, sweet meringue. 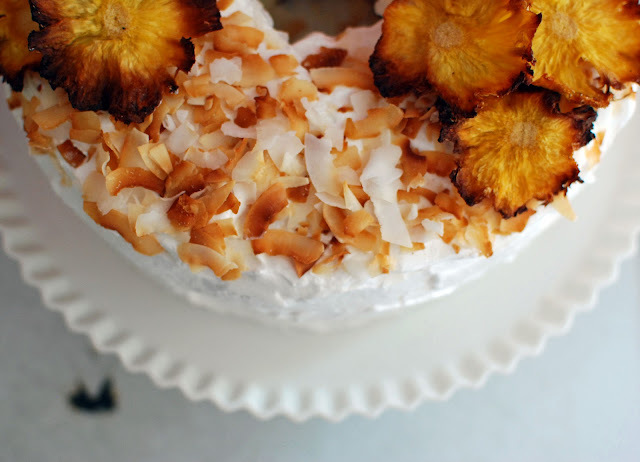 The top is sprinkled with fragrant toasted coconut and adorned with pineapple flowers. This cake is light, summery, sweet and tastes delightfully wicked (despite its angelic lineage), filling your kitchen with sounds of ecstasy...and your head with ideas you might later need to confess. Enjoy! Sift together flour and 3/4 cups sugar four times. Set aside. With electric beaters or a stand mixer fitted with a whisk attachment, beat together egg whites and water on medium speed until foamy. Add in salt, cream of tartar and extracts, beating until soft peaks form. Increase speed to medium high and gradually add remaining 3/4 cup sugar, one tablespoon at a time, until all is incorporated and meringue is stiff but not dry. If necessary, transfer to a larger bowl. In six additions, sift flour/sugar mixture into meringue, folding quickly but gently after each addition. Pour batter into an ungreased tube pan and run a sharp knife through the batter to dispel any air bubbles. Smooth top with a rubber spatula and bake at 350 F for 35-40 minutes until golden brown and springy to the touch. Invert pan onto the neck of a glass bottle (a wine bottle works well) to let the cake cool upside down to avoid deflating. Remove from pan once completely cool (about an hour). Place a heatproof stand mixer bowl over a pot of simmering water. Add egg whites, sugar, water, and cream of tartar, whisking until foamy over medium heat (about 5 minutes). Attach bowl to mixer and whisk on high speed until glossy and billowy (about 7 minutes), adding in the extracts during the last minute. Remove top 1 1/2" of cake as a layer and set aside. Cut a 1" deep trench in bottom of cake and fill with meringue. Replace top of cake and frost top and sides with meringue. Top with toasted coconut and pineapple flowers (optional). Cut top and bottom off of pineapple and slice off the rind. Pop out any eyes or seeds that remain. Using a serrated knife, carefully cut a 1/8 " slice up to the core, rotating the pineapple as you go before you cut through the core completely. Cut as many slices as you would like flowers. Using paper towel, press out as much moisture from the pineapple slices as possible. Lay the slices in a single layer on a parchment-lined baking sheet. Bake at 225 F for 1 1/2 hours, rotating the pans and flipping the slices every half hour or so. The baking time really depends on the ripeness and juiciness of your pineapple, so keep a close eye out. 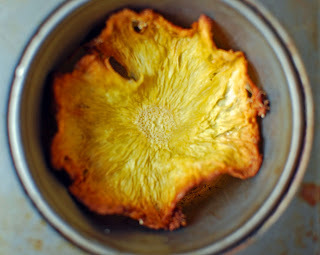 Once the slices have shrunken down and are turning brown at the edges, remove from the pan and gently place in a muffin tin to help create the natural flower shape. Let sit overnight to dry out completely. 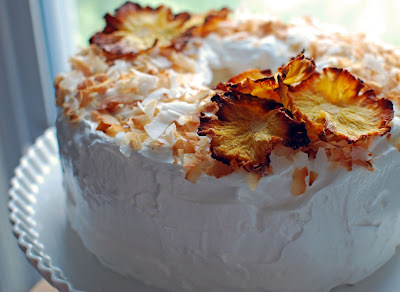 To decorate the cake, sprinkle generous handfuls of the toasted coconut on the top and arrange pineapple flowers as you desire. I am happy to report this was the first piece of MANY! This cake looks amazing! I love that it's called cloud cake and it's got flowers made out of pineapples! What more could you want from a cake? This is stunning and looks like it would be really fun to make! Plus, I love that the recipe includes cut out cake bits - who doesn't want to make something that is virtually instructing you to eat it as you go? All your recent entries are looking fabulous my friend. Miss you! Happy baking!